S E Lindberg: Lords of Dyscrasia Promotions - Free Books! Lords of Dyscrasia Promotions - Free Books! 1) Through Halloween 2011 (10/31/2011), I am giving away free paperbacks of Lords of Dyscrasia via Goodreads.com (open to U.S. and Canada due to shipping constraints). Goodreads assigns winners randomly from a list of anyone who requests to be included. 2) LibraryThing.com (click link) will be hosting a Giveaway of 50 ePubs. This is the easiest way to share the novel globally (Giveaway starting Oct. 1st 2011). LibraryThing offers a few types of Giveaway programs, this Member version selects winners randomly from any who request it. 3) Read the ePub and get a free paperback! I am offering complimentary signed paperbacks to those who post on-line ratings, reviews, or testimonials. The first chapter is free, and full version only $2.99. Click here to find out how to sample the ePubs! ForeWord gave it 5/5 stars. Do you agree? ﻿Foreword Clarion Review gave Lords of Dyscrasia 5 stars! Lindberg, who also created more than 50 illustrations and the cover for this book, makes the majority of current popular fantasy fiction read like recipes by comparison. 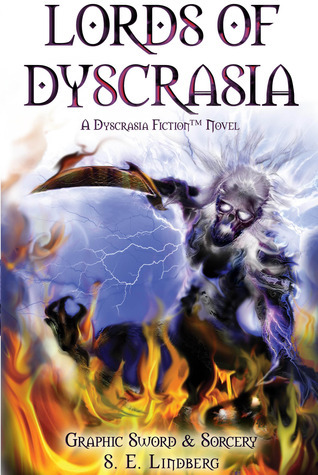 Lords of Dyscrasia is highly recommended, though not for the faint of heart."